The two year anniversary of Super Storm Sandy has just passed, and many people are looking back on the long and hard road to recovery with less than fond memories. Tens of thousands of homeowners have spent millions of dollars repairing their storm damaged homes, and thousands more have had to have their homes lifted above the newly drawn flood levels or face insurance penalties. For these homeowners whose properties have had to undergo elevation projects, the costs can become staggering. For just this reason, federally funded grant programs have sprung up to help homeowners shoulder the burden of a costly New Jersey house lifting project. Chief among these grant programs aimed at funding New Jersey home lifting projects is the Reconstruction, Rehabilitation, Elevation and Mitigation program, or RREM for short. The RREM program provides homeowners whose properties fall within the newly drawn FEMA flood maps with up to $150,000 in federal grants to cover the cost of a home elevation. Many homeowners, however, have noticed that the cost to have their home lifted within the bounds of the RREM program can be double the cost of having the same lift performed outside the program, often times making the project cost even more out of pocket than if it was handled privately. An example of this phenomenon was recently reported by the Asbury Park Press. Scoot Ingold, a homeowner in Little Egg Harbor, New Jersey has seen the cost of his home lift balloon, an increase owed nearly entirely to Ingold’s involvement in the RREM program. Ingold claims that the same home lifting firm that quoted him around $100K to complete his home elevation in the months before he secured funding from the RREM program is now charging him over $200K to complete the lift. While homeowners in Ingold’s situation are quick to cry foul at such a price jump, claiming that contractors are taking advantage of both homeowners and the program, the truth is that the increased cost has more to do with strict federal regulations than with unscrupulous business practices. The goal of the RREM program is not to give hand-outs, but to mitigate that damage done by future storms. As such, in order for a home elevation project to qualify for RREM funding, it must be shown that the home is capable of withstanding another storm, of which elevation is only one factor. 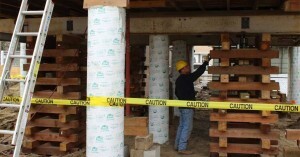 If the home is deficient in other ways, these issues must be corrected in conjunction with the home elevation process. This ‘some-strings-attached’ structure has meant that many New Jersey home lifting projects falling under the umbrella of the RREM program are costing homeowners more than they initially expected. 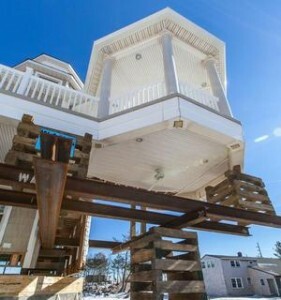 Penn Jersey Development Co., a professional New Jersey house lifting firm, has been active in Sandy Recovery efforts since the storm hit and is an RREM approved contractor. Our expert customer service reps have the experience and understanding of RREM regulations to intelligently discuss the pros and cons of the program and whether or not it is right for you. Whether you choose to complete your New Jersey home lift under the RREM program, or simply pay out of pocket, Penn Jersey Development Co. is here for you; for the last storm, for the next storm, and for every storm after that!